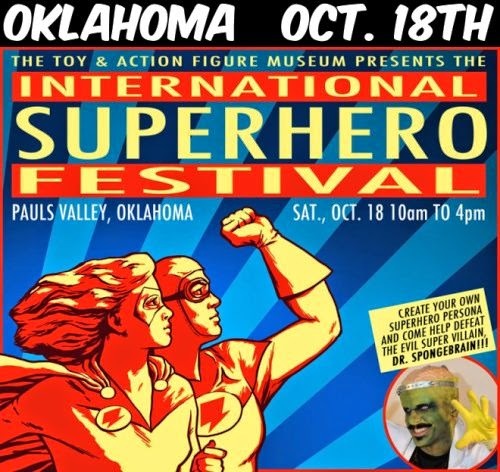 The Toy & Action Figure Museum in Pauls Valley, Oklahoma is hosting the first INTERNATIONAL SUPERHERO FESTIVAL on Saturday, October 18th from 10:00 to 4:00!!! It will be held next to the museum on McClure Street. There will be some SUPER bands performing, including The Middle of Nowhere Band, The Part-time Savants and the incomparable Michael Kleid!!! Rumor has it that Dr. Spongebrain has escaped jail and is headed back to Pauls Valley to seek revenge for his defeat last year at the hands of Rivit and the gathered superheroes! We're not quite sure what he plans, but we need all the superheroes we can get to defeat this nefarious foe!!! Also: The Toy & Action Figure Museum is hosting a COSPLAY CONTEST on Saturday, October 18, as part of The International Superhero Festival. First prize is $1,000 CASH!!! (Second is $500 and third is $250). The downtown area will virtually be turned into a Superhero Movie set!!! There are all kinds of wild things planned... including a genuine SUPER VILLAIN to battle!!! The best part? It's all FREE to participate!!! So come out dressed as your own original superhero, or even your favorite superhero, and help save the town! IT ALL DEPENDS ON YOU!!!! For more info please be sure to visit their TOY & ACTION FIGURE MUSEUM Facebook Page!